I'm at the library again because this is my third home (my first being my dorm room and my second being the marching band field), and tonight I thought I'd be responsible and try to do some research earlier than I absolutely had to for a deadline. So I logged onto a library computer, plugged "World War I" into the catalog search engine, and scrolled through the results until I came to an interesting-looking diary of a solider in World War I. 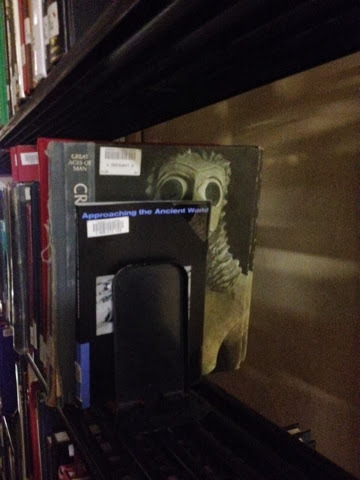 See, normally I just do my research on the Internet, but my professor's encouraging us to use books, and I'm already at the library, so why not? Books are easier to cite than websites are, anyway. I snapped a pic of the book's location using my iPhone and then strolled over to the chart by the elevator that tells which floor contains which section of books. My book was located on LL. "LL?" I thought to myself. "Lower Level? The basement?" 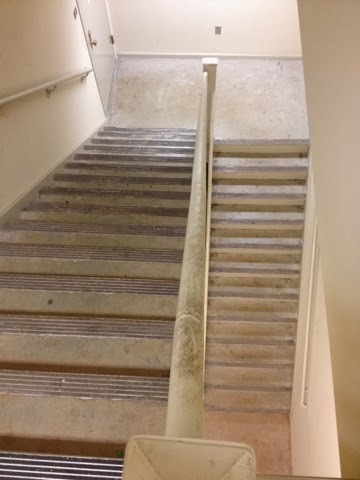 In my two years and two months at this university, I'd never descended into the basement of the library. I knew it was where people went to hide during tornadoes. I'd heard rumors that it was where the Satanist books were kept. I'd never seen it for myself, though. In fact, I wasn't even entirely sure how to get there. A picture's worth a thousand words, isn't it? ...gross. That's not at all what I'm accustomed to seeing at our library. Most areas of our library are clean and quite attractive, often with comfy or cool-looking furniture. But in the spirit of adventure (and finding my book), I descended. And I was quite alarmed by what I found when I opened the door at the bottom. The basement is... dismal, to say the least. Dark, dingy, even a bit creepy, and with lots of personal work spaces. I guess the basement is where you go if you really don't want to be disturbed. There were two people down there when I entered. One of them looked up at me as if he were shocked to see another human being. 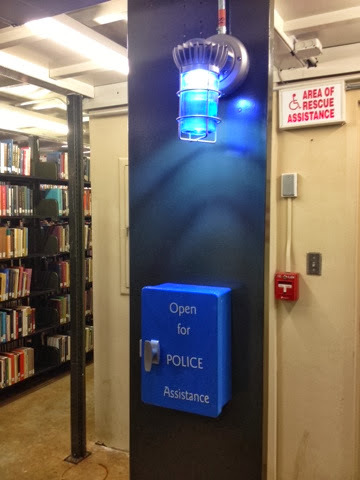 We have these emergency phones scattered across campus, always marked with a blue light so one can find it at night. However, they're typically located on the streets and in parking garages... not in the library. 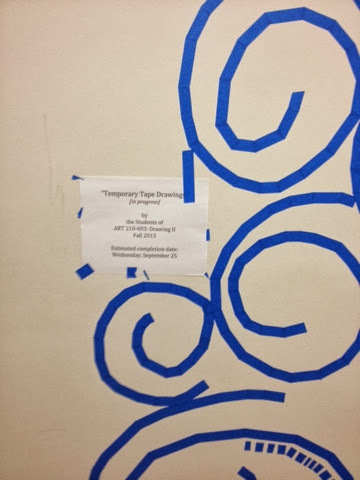 I also kept seeing signs stating that this area was under surveillance and that any inappropriate behavior would be reported to the campus police. Now, I didn't actually see any cameras, but the signs and emergency phone made me wonder exactly what has gone on down in the basement in years past. Couples on a study break? Satanic rituals? The other floors of the library are similar to the basement in that they have aisle after aisle of books, but the floors are actually tiled, there aren't so many clunky ducts (there could have been a spy hanging out in those things for all I knew), there are actually ceilings and bright lights, and the shelves aren't so dull and depressing. I walked down one aisle that was so dark I couldn't read the titles of the books. I had to whip out my phone and use the new flashlight feature in the control center. Good thing I updated to iOS 7, eh? 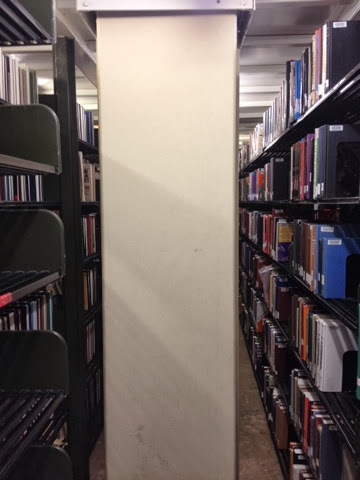 Did that really seem like the best place to put a bookshelf? I never actually found the book I was looking for. I went to the shelf on which it should have been waiting for me, but it was strangely absent. I didn't find any helpful books down there, unfortunately. 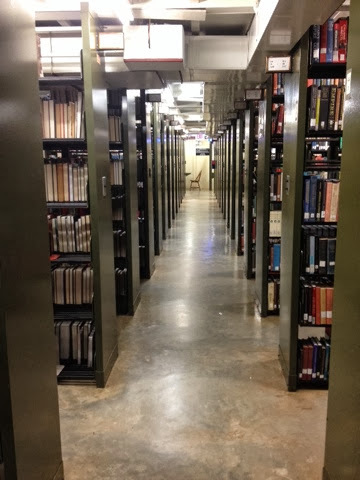 Feeling that I had wasted enough time, I ascended back to the civilized world, feeling a little unsettled but definitely more enlightened for having finally seen the library's basement. 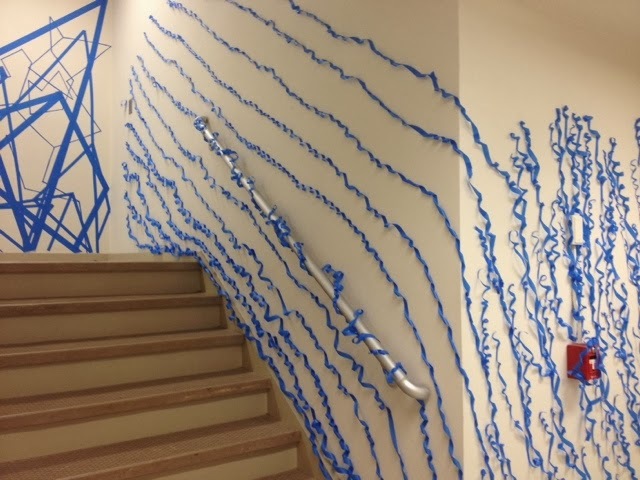 I very much approve of decoration on the walls, and I can't wait to see how the art students responsible for the designs finish their project. The air smelled like whatever it is that makes painter's tape sticky. I'm not sure if it's better or worse than the smell of lonely basement books. 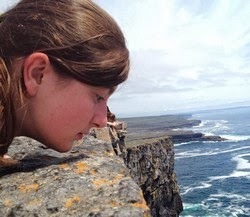 Nice Adventure! Dark Tunnel. Unmarked door. Was there any spooky music playing? Haha! Nope, just creepy, eerie silence. :) Would have been appropriate, though. Thanks for reading! Sounds like the makings of a great book. Hint. Hint. I'll have to add that to my list of ideas! Thanks for reading!